My baby has developed a new addiction, fueled by his newfound independence and his newly acquired ATM card! He’s been running down to the nearby gas station and buying Pumpkin Spice Latte/Coffee something or others. $1.50 a shot, sometimes twice a day. Even at just one a day, this young man would be spending $547.50 a year! This from the one that wants a better X-Box and his own TV. I think we just found the money for him. Ya buy ‘em books, ya buy em books and all they do is eat the pages. Thank goodness we’re not too close to a Starbucks, because they’re a lot pricier there. Buying a single Starbucks version at $4.00 a day would cost you $1,460 a year. Wow…and you didn’t think you had enough money for that little getaway you wanted? As for the latte? I did have a taste and I knew I could do better, so with a little tweaking and a little testing (and we had so much fun doing this) we came up with a blend we love. Hope you love it, too, and share it with friends or family on a cold, snowy (or rainy) fall or winter night. Make a large pitcher, if desired, and store overnight in the fridge – the flavor is even better the next day and the spices drop to the bottom where they are easily left behind. They’ve done their work and are resting. They earned it. Then try it cold (num – I know, hard to believe, but trust me) or reheat in the microwave. A happy accident: In my effort to be fabulously frugal, we wanted whipped cream and I didn’t want to whip up small bits – I wanted these at a moment’s notice. I placed dollops of whipping cream on a parchment lined tray and froze them, see Whipping Cream for the Freezer. 1 teaspoon of vanilla extract or a teaspoon of brandy, spiced rum, etc. whipped cream for garnish, if desired – see options and nutritional values, below. Combine milk, coffee, pumpkin, spices and sugar in a saucepan. Cook over medium heat, stirring, until steaming. Remove from heat; stir in vanilla or brandy. Either top with whipped cream or whisk the latte until foamy – this is best done in a heavy cup, like a Pyrex 2 cup measure. Put the whisk in and holding the handle between palms, move hands back and forth very briskly, twirling the whisk. (Think of a Boy Scout starting a fire with a two sticks.) To get any decent foam at all, whisk wildly and for several minutes. Garnish simply with a little grate of nutmeg, pinch of pie spice or cinnamon. Note: excess pumpkin may be portioned in ice-cube trays and frozen. Use a coupon matching site! I check their site every week, even if I don’t “need” to go to the store and often find bargains I can’t pass up. Follow my 12 Strategies – You’ll see them on the upper drop down menu of every page and how I apply them, below. Don’t get discouraged if your prices don’t match mine! Keep shopping at the best prices and your fridge/freezer and pantry will be stocked with sales priced ingredients. Read Strategies Applied for additional tips as well as throughout the recipe, for saving time and managing food. 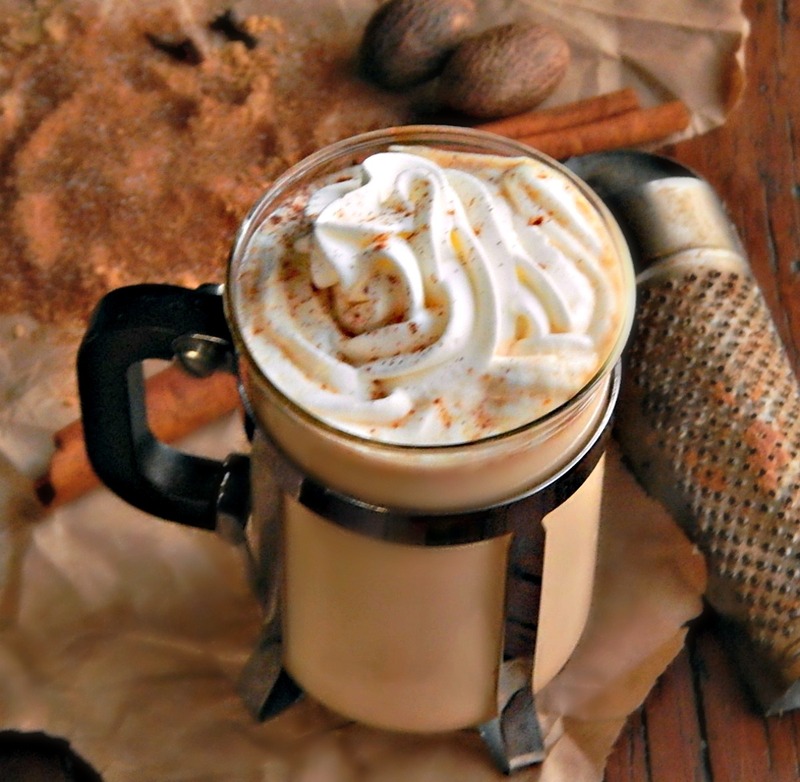 I like the fact that this DIY Pumpkin Spice Latte has 1/2 serving of vegetable per latte! With 3 tablespoons whipped cream: Per Serving : 174 Calories; 2g Fat (13.1% calories from fat); 9g Protein; 28g Carbohydrate; 1g Dietary Fiber; 11mg Cholesterol; 135mg Sodium. Exchanges: 0 Grain(Starch); 1/2 Vegetable; 1 Non-Fat Milk; 1/2 Fat; 1 Other Carbohydrates. Without the whipping cream: Per Serving: 155 Calories; 1g Fat (3.7% calories from fat); 9g Protein; 28g Carbohydrate; 1g Dietary Fiber; 4mg Cholesterol; 133mg Sodium. Exchanges: 0 Grain(Starch); 1/2 Vegetable; 1 Non-Fat Milk; 0 Fat; 1 Other Carbohydrates. Maybe I’ve had too many Blizzards in my life, but I kept thinking how wonderful this would have been with finely crushed gingersnaps sprinkled over the whipping cream. You could certainly play with the spices and tweak it exactly to your taste. Pumpkin Spice Latte made Fall 2011. This entry was posted in Click here for Fabulous Food Posts and tagged Beverages, Coffee, condensed milk, Cream, Latte, milk, Pumpkin. Bookmark the permalink. This is going to be great this fall!